For the past five years or so, Ghana has ploughed a somewhat lonely furrow in the world of mobile money. 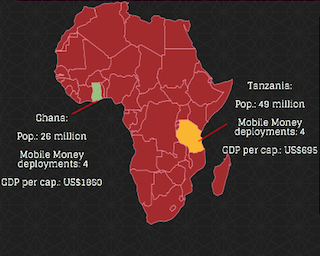 One of the wealthiest countries (per capita) in West Africa, Ghana also has one of the highest banked populations in Sub-Saharan Africa, at around 30% , and one of the 10 highest unique mobile subscriber penetration rates, at almost 50%. This led many to believe late in the last decade that Ghana was sitting ripe to become the next big thing in mobile money. Unfortunately, things have not quite worked out as anticipated. For while Ghana has recorded slow but steady growth in mobile money adoption and usage, local deployments have failed to catch fire as many had hoped. Many fingers of blame point at the unusual regulatory regime in the country that underpins what is essentially a branchless banking model of mobile financial services (MFS). Unlike in some other markets, however, the Bank of Ghana (BoG)’s adoption of a “many-to-many” model back in 2008 was done in a spirit of openness to and relative enthusiasm for the branchless banking proposition, aligning as it did with a stated goal of the BoG to reduce the amount of cash in circulation in the Ghanaian economy and accelerate the digitization of payments. Nonetheless, good intentions do not always lead to the desired destination, and in the case of Ghana’s mobile money regulation resulted in misaligned incentives and responsibilities between mobile network operators and their multiple bank partners. The BoG believed that its stance on forbidding exclusive bank-MNO agreements would help establish a branchless banking system that was primed for interoperability, which synched with a push for interoperability in the nation’s ATM network. In reality, though, managing multiple bank partners in one mobile money deployment proved a difficult task for Ghana’s telcos (MTN, for example, had nine bank partners in 2009). At the same time, banks proved reluctant to invest in a product the rewards from which were less than clear. Moreover, although most of the heavy-lifting in terms of agent management, customer on-boarding, etc. fell to telcos, the customers and the accounts ultimately belonged to the banks. It was not a recipe for success. In this context, the progress made by Ghana’s mobile money deployments in the past 6 years is noteworthy, but has barely made a dent in the addressable market for MFS in the country. A recent report by Mondato estimated that in an addressable market of some US$110bn, in 2013 less than 1% of this figure was accounted for by MFS. Even on current growth trends, by 2018 still a mere 4% of the maximum potential market for MFS will be catered for. The Bank of Ghana, to its credit, has shown an openness to learning from past mistakes and making the necessary changes to create a regulatory environment that both enables and follows a functioning and healthy market. It is understood that a thorough review process of the country’s branchless banking regulations has been ongoing for more than a year now, and that the issuance of new regulations is likely to be forthcoming soon. Significantly, there is a confident expectation that the new regulatory environment will see the abandonment of the many-to-many model. It is hoped in many quarters that this break with the past will facilitate bank-MNO partnerships that can generate the requisite levels of investment from all stakeholders that are necessary to put deployments on paths of secure and sustainable growth. Concerns about interoperability are likely to have been calmed by Tigo Tanzania’s negotiation and implementation of Africa’s first completely interoperable mobile money service, further evidence that market-led frameworks may yield better success in this area. In the unlikely event that the BoG is unable to arrive at a better functioning regulatory framework, by 2018 Mondato estimates that the value of Ghana’s MFS market will still be worth less than 20% of Tanzania’s, for example. Nevertheless, the market would be one that was more evenly balanced between P2X and B2X transactions, having avoided the obvious benefits, but also many of the pitfalls, of having P2P remittances and airtime top-ups overwhelmingly dominate as the main on-ramp for adoption and usage. Indeed, the size of Ghana’s SME sector, which is larger than most comparable African economies, yet which is still much more cash-based in comparison with a country such as South Africa, offers significant opportunity for growth in the B2X transaction category in Ghana between now and 2018, even without significant regulatory reform. In 2013, the MFS B2X payment category in Ghana accounted for a negligible amount of the country’s transactions. Mondato estimates that by 2018 that will have grown to be worth around US$1.8 billion, with over $1 billion worth of mobile B2B transactions alone. All of this serves to highlight that even in markets where growth in mobile financial services over the coming few years is forecast to be unspectacular, real revenue-generating opportunities exist for agile MFS practitioners who can identify and cater to genuine pain points. As one of our commentators in last week’s Mondato Insight on India noted, you only need a tiny fraction of a trillion-dollar market to realize commercial success. Of course, Ghana is not a trillion-dollar market. Irrespective, by Mondato’s estimates there are some US$135 million of annual revenues to be generated by 2018 for MFS vendors catering to the needs of consumers and businesses in Ghana, even with comparatively low levels of MFS penetration. And while this figure represents a little over a quarter of the equivalent estimate for Tanzania in 2018, it demonstrates that even in markets where MFS growth figures do not grab headlines, real and significant opportunities exist for those who are attuned to them. And if the BoG lights a fire under the current regulations and puts in place a system that provides both certainty and the right incentives for players to move forward? Just like the gold eagles that hold the country’s coat of arms, MFS in Ghana could finally be ready to soar. See the insert below (click to expand) for Mondato’s projections. All figures in this post are from MFS in Africa: Characteristics, Forecasts, Trends (2015) unless otherwise stated. The addressable market is the total value of all transactions that could be initiated from or to a mobile device, and is a subset of the total value of all transactions that take place within the country. The total addressable market may be higher than the focus country’s GDP as it includes all transactions (including intermediate transactions) that could be initiated from or to a mobile device.